These excellent images come courtesy of Ian Adams, celebrated landscape and nature photographer, and I appreciate him allowing me to share them. Shortly after Ian put out feeders at his Cuyahoga Falls, Ohio residence, he attracted this oddity to the tubed up thistle seeds. 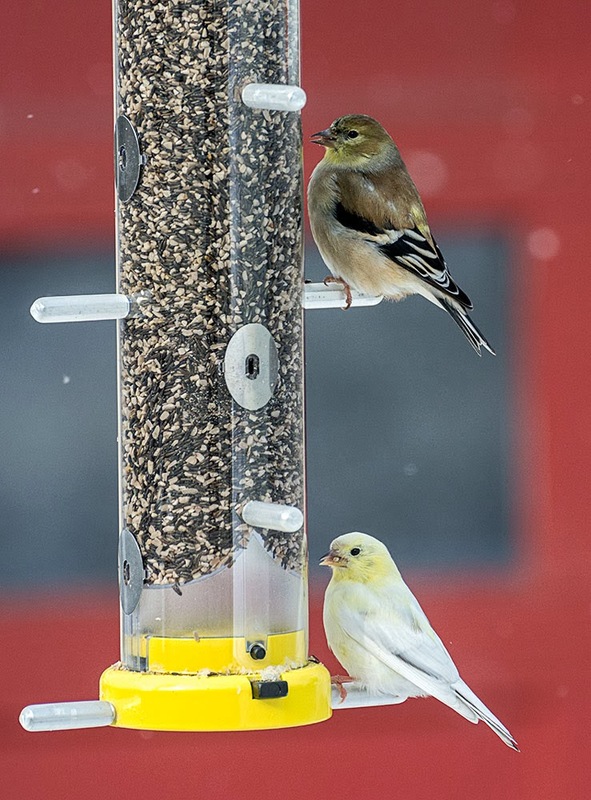 That's a male American Goldfinch up top, still largely in its somber winter colors. It won't be too much longer, and it'll shed those bland feathers and explode into the brilliant lemony hues of a wild canary. The lower bird is not as clearcut an identification, and could be a stumper if it were seen by itself. The fact that it consorts with goldfinches helps on two counts: guilt by association, and the fact that we can readily compare it to other normally clad members of its species. We beam in on the ghostbird, and can easily see the trademark characters of a male American Goldfinch bleeding through. This individual is leucistic (loo-kis-tik), leucism referring to a genetic anomaly that causes dark melanin pigments to become washed out and pale. 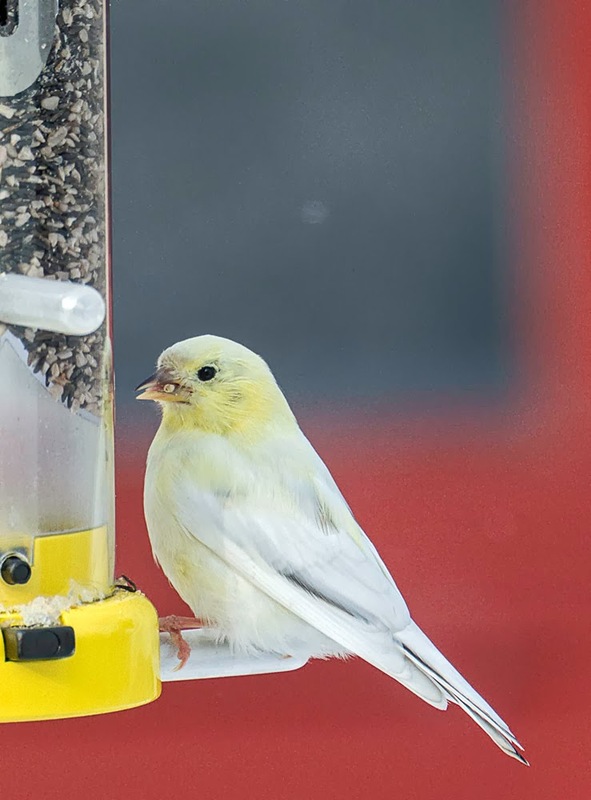 I've written about leucistic birds plenty of times, and THIS ACCOUNT gives a more in-depth explanation of the phenomenon. Leucistic animals are sometimes confused with albinos, but the latter would have pink eyes and most likely be snow-white. Truly albino birds generally don't fare well, either, at least in the wild. Their feather shafts and other supporting structures tend to be weakened, and their vision can be impaired, none of which aids survival. The prevalence of leucism is probably essentially an odds game. The more individuals in a species' population, the more likely a leucistic individual will show up. That's why "piebald" (as leucistic animals patchily blotched with white are often known) are commonly reported in abundant species such as American Robins, Red-tailed Hawks, and White-tailed Deer. Thanks to Ian for sharing his images. I hope this goldfinch sticks around so that we can see what if anything changes as it progresses through its molt into alternate plumage. If you're in the Cuyahoga Falls area and are interested in seeing/photographing this ghostly goldfinch, flip me an email and I'll pass along Ian's contact info.